The 45th lnternational Humor Exhibition of Piracicaba 2019, realized by the Piracicaba City Hall/Cultural Action and Tourism Secretariat/National Graphic Humor Center of Piracicaba will be held in accordance with the following cheduIe – Registration: until June 21. Selection Jury: July 06 and 07. Awards Jury: August 03. Opening Ceremony: August 10. Closing: October 27.
f) Maximum measures allowed: paper- 42 x 30 centimeters (A3) (16,54 x 11,81 inches), sculptures - 42 centimeters or 16,54 inches (height) x 30 centimeters or 11,81 inches (depth) x 30 centimeters or 11,81 inches (width). FUNDIART SCULPTURE AWARD (open for sculptures that deal with cartoons, cartoons, cartoons, strips), UNIMED HEALTH AWARD (works addressing health issues), ARCOR CHILDREN'S RIGHTS PRIZE (for works that address children's rights, commemorating 15 years of the Arcor Institute Brazil) and DERWENT ORIGINAL WORK AWARD (for original works in 2d free technique). i) Along the registered artwork, the artist must attach a complete registration form with legibly writing. lt is also requested reduced curriculum and photo, for registration in the CEDHU's data base. To make sure your work is original, it is suggested to the artist to check on specialized websites if there is no match of image, text and / or situation of your work with another already published in newspapers, magazines or websites. If there is confirmation of plagiarism the work will be automatically disqualified. a) Five 1st place prizes in the amount of R$ 5.000,00 (five thousand reais) each, divided among the categories (cartoon, charge, caricature, comic strips). b) A prize of R $ 5,000.00 (five thousand reais) called "IMMIGRATION THEME AWARD", destined to works of any category (cartoons, caricature, charge or comics strips) that address the theme IMMIGRATION, proposed by the organization of the event to the 2019 edition. c) One award of R$ 10.000,00 (ten thousand reais) called GRAND PRIZE INTERNATIONAL HUMOR OF PIRACICABA chosen among the five winners of each category (cartoon, charge, caricature, comics strips, and thematic). g) a prize of R$ 5.000,00 (five thousand reais) called ÁGUAS DO MIRANTE AWARD, intended to work by Brazilian authors in any category. h) A prize of R $ 5,000.00 (five thousand reais) called FUNDIART SCULPTURE AWARD, destined to sculptures. Thus, sculptures will compete only among themselves in this category. i) a prize of R$ 5.000,00 (five thousand reais)called the INSTITUTO ARCOR 15 YEARS PRIZE, entitled "CHILDREN'S RIGHTS", aimed at work on the topic "Children's Rights". The award is commemorative and will be held only in the 2019 edition. j) A prize in the amount of R $ 5,000.00 (five thousand reais) called the ORIGINAL DERWENT Prize, destined for original works in 2D. No 3D works (sculptures) will compete. Artists of all nationalities will be able to compete. The values corresponding to the cash prizes will only be deposited in a current account in the name of the winners according to the legislation established by the Municipality of Piracicaba responsible for the International Humor Exhibition of Piracicaba. It is mandatory that the winning artist has a current account in his name and he must inform it on the registration form. If you do not provide a current account within 02 (two) months, counted from the day of the announcement of the winners, payment of the prize amount will be canceled. Authors of countries that face economic embargoes of any kind with Brazil and that make impossible the transfer of the monetary values of possible awards can only compete for nominations of honorary prizes. c) After the exhibition, the original works must be withdrawn by the artist or authorized person carrying a letter of authorization signed by the artist, at CEDHU - Piracicaba, within a period of up to six (6) months, counted from the closing date of the exhibition. show. After the deadline, CEDHU will exercise the right of ownership, according to its interest. d) Awarded authors (including honorable mentions) transfer the assignment of the Copyrights of their work, in accordance with Law 9.610 of February 19, 1988 (Copyright Law). total, universal and definitive, in all the modalities of use and free of charge, protected by said law referring to the work (s) awarded at the International Humor Exhibition of Piracicaba, which are now part of the Municipal Public Patrimony for all rights purposes, in accordance with the Municipal Law n 2249,1976, partially amended by the Municipal Law n 2486-1982 and consolidated by the Municipal Law n 5194-2002. 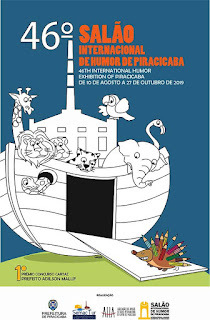 0 Response to "The 46th lnternational Humor Exhibition of Piracicaba 2019, Brazil"